I've probably mentioned already that I'm teaching a crochet sock technique class at Houston Fiber Fest on 23rd June. Oh yes, I'm going to be famous! I decided to design my own small sock which can be completed in the two hour class to introduce my twelve students to some of the techniques. I could have asked a designer for permission to use one of their patterns and I will definitely be recommending patterns from designers that I have made and loved but I do enjoy a bit of a challenge. My main focus has been teaching rather than designing....oh and the odd bit of blogging obviously here on craftyescapism.com And I have written a few simple patterns for my charity crochet group Yak & Yarn before but have yet to publish anything officially. I really didn't know where to start but after listening to the seven part Crochet & Knitting Design & Self-Publishing Mini Series by Marie Segares on her wonderful Creative Yarn Entrepreneur Podcast show I felt ready. It has however taken me weeks to finally send the design off to my tech editor. Partly this was due to the pattern writing process itself. 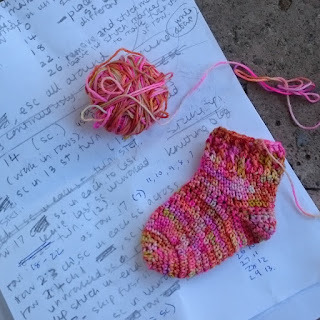 I started off writing and making one size and picking up my favorite hook for socks but after my test crocheter said she wanted to make a toddler sock I had to get into gauge and grading. Things then became a lot more complicated. I was finally happy with my design and made the small size but couldn't help tweaking it a bit. Then I thought I'd make the largest size to see how much yardage I needed and figured out my stitch count was out on my small size. Argghh! Then I was distracted by other unrelated crochet projects - CALs and test crocheting that I really shouldn't have taken on but I have no self control whatsoever. And then of course there is the rest of my life when I am not doing anything crochet related! I do wonder how designers manage to get a whole book of designs out. It is an incredible feat! I'm working on the content of my class so if you have any questions about crochet socks please do let me know. I will endeavor to answer and it will be super helpful preparation!! Just listened to my first pod cast .It was about your crafty socks . Had to listen really carefully as volume not grant on my iPad.Super stuff Tamara. I cracked up at your "because I have no self-control whatsoever" because I can SO relate! I need to finish Marie's series (I think I've listened to the first 2) because I just finished a slip-stitch knitting pattern, and now I'm getting the itch to try applying it to a new pattern of my own. :) Your crocheted sock pattern looks great, and I know you're gonna wow them at the Houston Fiber Fest! Thank you for your kind words Nicole. I'm really looking forward to the Fiber Fest. It's going to be such fun. Marie's series is SO good. Can't wait to see your pattern! Your little sock reminds me of the little Christmas stocking decoration that I came up with when learning about basic sock construction formulae. Your pretty sock is cute. Thank you Jodie. Yes the small sock would make a super holiday decoration in the right colors! I think you really need to make a sock to understand the construction. I'm not surprised to hear that you've been designing socks too!